We’d love your help. Let us know what’s wrong with this preview of Be Still, My Heart by Cindy Flores Martinez. All in G 7 Contemporary Christian Romances. Published April 10th 2018 by Kydala Publishing, Inc.
To ask other readers questions about Be Still, My Heart, please sign up. This review is for two novellas in this sweet anthology of Christian romances. Both of the novellas I read told a story of second chances at romance. All in Good Time is written by Diana Lesire Brandmeyer. I found this to be a unique romance because Sandra and Kevin are in their 60's. The story of their renewed friendship is believable and sweet. But what I loved about the story is the relationship of Sandra with her granddaughter, Lucy. The sharing of family tradition and legacy strengthens thei This review is for two novellas in this sweet anthology of Christian romances. Both of the novellas I read told a story of second chances at romance. All in Good Time is written by Diana Lesire Brandmeyer. I found this to be a unique romance because Sandra and Kevin are in their 60's. The story of their renewed friendship is believable and sweet. But what I loved about the story is the relationship of Sandra with her granddaughter, Lucy. The sharing of family tradition and legacy strengthens their already strong relationship. I have watched my older children bonding with my parents in a similar way. The Inn at Cherry Blossom Lane is written by Jennifer Vander Klipp. This is a romance of second chances is more traditional in that Claire and Alex are in their mid-30's when they meet again. Claire is pursuing a dream from the past, one that involves turning her grandmother's historic home into a B&B. The setting by Lake Michigan is lovely. The author's descriptive prose pulled me into the setting, dreaming about making my own personal trip to a lovely B&B with bonfires on the beach. This romance includes a mystery as well. I found both stories to be enjoyable. This book had a little bit of everything. Romance, history, mystery, and a beautiful setting. Jackie Castle did a great job of creating a story that is inviting, heartwarming, and keeps your interest. I would love to be able to visit this town in real life, but for now I'll settle for another story! First of all, I like that the characters in this book are older. You don't see a lot of that in the romance world today. It really was a sweet story about two old acquaintances coming together. But more than that, I liked the relationship between Sandra and her granddaughter. In fact, some of the best scenes in the book came from the two of them together. It made me think about my future, and if I have a granddaughter if we might interact the same way. This story was sweet, charming, and fun. I want to jump in and live in this book. The setting was beautiful, the characters are engaging, and I can totally picture myself at this B&B. It did not take me long to fall in love with this story, the house and the characters. It was vivid in my mind and quite honestly I didn't want to leave. I hope there is more to come from this B&B! I sometimes get nervous about two widowers coming together, but thought this was a sweet story that shows the power of hope and moving forward. Sometimes life can surprise us, but we have to learn to accept it and have the willpower to keep going. Suzann reminds me of many young girls today - anxious to get that romantic proposal and marry the man of their dreams! I think a lot of those girls should read this story. When life throws you a curve ball and things don't go as you expect, you need to learn how to deal with it and rely on the Lord for guidance. Allie Pleiter does a good job in portraying that message. We all have a past to overcome, and at some point have to deal with how others perceive us and our family. Rumor mills are sometimes hard to deal with, and I like the way this story was written pertaining to that. The title to this story fits perfectly with the overall theme - Beauty is within as well as from God. I look forward to reading other stories by this author! I could easily relate to Liberty, as I am not your run of the mill skinny girl. I was so happy to see a "plump" character embraced, loved, and fun! I felt like she was my best friend, and I just wanted to hang out with her all the time. Oh this story really made me happy. Too often our society tells you that people fall in love because of how they look. And even in Christian fiction, we see both characters as skinny or average size and beautiful. Liberty IS beautiful, let's just get that out there. This is a story I will easily come back to in the future when I need a pick-me-up. Thank you Suzanne for writing this! Wonderful collection of sweet stories involving past love, rekindling love, new love, mystery and so much more. Each story is well written and very enjoyable. I received a copy of this book from the authors and this is my personal honest opinion. No review was required. I have read 3 of the 7 books in this collection. After reading this book, I want to move to Madison Creek (at least for the summer!) I liked the main characters, and some of the supporting ones are a hoot. I loved that even the villains are redeemable. One of my favorite lines is “Standing on her toes, her kiss was eager and drew him in like a hummingbird after sweet nectar.” Maybe that one is extra special to me because I enjoy watching the I have read 3 of the 7 books in this collection. After reading this book, I want to move to Madison Creek (at least for the summer!) I liked the main characters, and some of the supporting ones are a hoot. I loved that even the villains are redeemable. One of my favorite lines is “Standing on her toes, her kiss was eager and drew him in like a hummingbird after sweet nectar.” Maybe that one is extra special to me because I enjoy watching the hummingbirds at my feeders. Jackie Castle has written a wonderful addition to the Madison Creek series. I’m looking forward the next one! I liked All in Good Time. I enjoy Diana Brandmeyer’s writing style. It’s easy to read and follow the plot. I liked Kevin and Sandra, the main characters. Lucy, Sandra’s granddaughter adds a lot to the storyline. The fact that Sandra’s husband was declared MIA in Vietnam adds depth to the story and her character. Sandra’s past gives her wisdom to impart to Lucy. All in Good Time is a clean, sweet romance. Jennifer Vander Klipp has written an inspirational romance with just the right amount of mystery added in. Alex and Claire, childhood friends who developed a romantic relationship that fell apart due to distance and timing, are reunited to work on making Grandma’s house into a B and B. The main characters are very likeable, but not perfect. Alex’s dog and Claire’s daughter become instant friends. Who doesn’t like kids and dogs in the story? I liked and would recommend The Inn at Cherry Blossom Lane. I would definitely read more of Jennifer Vander Klipp’s books. This review is specifically for All in Good Time by Diana Lesire Brandmeyer and The Inn at Cherry Blossom Lane by Jennifer Vander Kilpp in this collection. They are both new-to-me authors and, though this is a collection of several novellas, their stories read like shorter-length novels than novellas. The characters and plot are developed and layered in each story. In All in Good Time, Sandra and Kevin, once sweethearts in high school, get an opportunity for a second chance in their golden years This review is specifically for All in Good Time by Diana Lesire Brandmeyer and The Inn at Cherry Blossom Lane by Jennifer Vander Kilpp in this collection. They are both new-to-me authors and, though this is a collection of several novellas, their stories read like shorter-length novels than novellas. The characters and plot are developed and layered in each story. In All in Good Time, Sandra and Kevin, once sweethearts in high school, get an opportunity for a second chance in their golden years. The story is told from third person through Sandra’s view and her granddaughter Lucy’s view. Sandra and Lucy’s relationship is sweet and it’s encouraging to see Lucy learn from Sandra’s life. Sandra’s friends are a riot and the dialogue is quite funny. It’s also a nice touch for the author to highlight a real missions-based charity that brings homemade dresses for little girls in Africa in the book. In The Inn at Cherry Blossom Lane, Claire and Alex, also high school sweethearts, get a second chance in their mid-thirties. Claire is a divorcee with a ten year old daughter who has decided to help her grandmother renovate the home into a B&B with a wedding venue. Alex is the contractor that Claire and her grandmother hire to rework the home. They both have some hurts in their past that actually draw them together. A good dose of suspense and mystery pleasantly surprised me in the plot. `Be Still, My Heart` is a set of (7) contemporary Christian romances. I will be reviewing 2 of the romances. `All in Good Time` by author Diana Lesire Brandmeyer and `The Inn at Cherry Blossom Lane` by author Jennifer Vander Klipp. ` All in Good Time` is a story about a grandmother, Sandra, whose husband is a POW and declared deceased after missing for many years. Kevin is Sandra's first love and he is back in town for their class reunion. Sandra's granddaughter, Lucy, will be moving in with he `Be Still, My Heart` is a set of (7) contemporary Christian romances. I will be reviewing 2 of the romances. `All in Good Time` by author Diana Lesire Brandmeyer and `The Inn at Cherry Blossom Lane` by author Jennifer Vander Klipp. ` All in Good Time` is a story about a grandmother, Sandra, whose husband is a POW and declared deceased after missing for many years. Kevin is Sandra's first love and he is back in town for their class reunion. Sandra's granddaughter, Lucy, will be moving in with her. This is a story about love and the reader will want tissues close by. `The Inn at Cherry Blossom Lane` is a short story about a hidden room and a diary written by a once-famous actress. I was pleasantly surprised at the brief mention of an author friend of mine, Liz Tolsma. Claire, the heroine, trusted the hero, Alex, enough to make herself vulnerable with him, but did she trust him enough to love him? Claire learns that ultimately God is in control. I give this book 4* out of 5* only because I wish they were longer and meatier. I would like to see these books rewritten as stand-alone books. I received this book Bibliophile Reviews, and was not required to give a positive review. This is seven Contemporary Christian Romance by seven different authors. I have read two of these wonderful novellas . I enjoyed this sweet romance novella by an author that is new to me, but looking forward to read more by her. The stories and the characters both were well written and well developed. This story involves past love. Can a past love be rekindled? I really enjoyed this sweet romance novella by a new author to me, and looking forward to reading more by her. I was drawn in right at the start and was hooked. Can two ever rekindle their first love? This is a story about love and mystery. Yes mystery that will have your guessing till the end. I was given a complimentary copy of this book , but was not told that I had to give a positive review. All opinions are my own. I’ve finished two books out of the collection – “All in Good Time” and “The Inn at Cherry Blossom Lane”. These are the stories of love, forgiveness, and second chances. I’ve enjoyed the relationship between Sandra and Lucy, their interactions, and deep conversations in All in Good Time. The Inn at Cherry Blossom Lane is a sweet romance and mystery…I was pleasantly surprised at the hidden room and a diary. Enjoyable reads! I received a complimentary copy of this book for review. I was not required I’ve finished two books out of the collection – “All in Good Time” and “The Inn at Cherry Blossom Lane”. These are the stories of love, forgiveness, and second chances. I’ve enjoyed the relationship between Sandra and Lucy, their interactions, and deep conversations in All in Good Time. The Inn at Cherry Blossom Lane is a sweet romance and mystery…I was pleasantly surprised at the hidden room and a diary. Enjoyable reads! 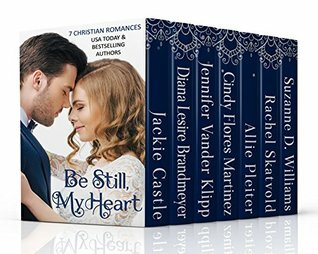 Be Still, My Heart is a great collection of seven contemporary Christian romances written by seven different authors. The stories range from first love to second chances, finding love against all odds and friends taking a chance at love. This is great collection to step out and maybe try a different genre or a new to you author. You won't be dissapointed. I liked this collection of sweet romances. The characters were believable and the stories made me feel right at home. I was wanting to know more of how their lives went when the story was over.. I was gifted a copy from the author/publisher, I was not required to write a review. My review was voluntary. A wonderful anthology full of warm, sweet, Christian romances. I had read a couple of these stories as standalones before this volume was published. I enjoyed them as much the second time around. I spent a great one of our crazy spring weekends ignoring the cold, snow, etc . and being warmed by these great stories. 7 stories and each is so different. Second chance love, first love, starting over after loss, a mystery, widow(er), new love and past infidelity and so much more. I recommend this set. Each is a clean christian romance with real life issues. A great collection of stories that will keep you reading even if you only have little bits and pieces of time to read.